I'm seeing drawstring bags everywhere: on-line, in catalogs and on social media. The are easy to sew and fun to use. They are also a great way to show off a fabric you really love. I've used several of my "Dogs at the Farmers Market" fabrics printed by Spoonflower.com for these 3 bags. The pattern I used for my bags is the "Lined Drawstring Bag" designed by Jeni Baker. 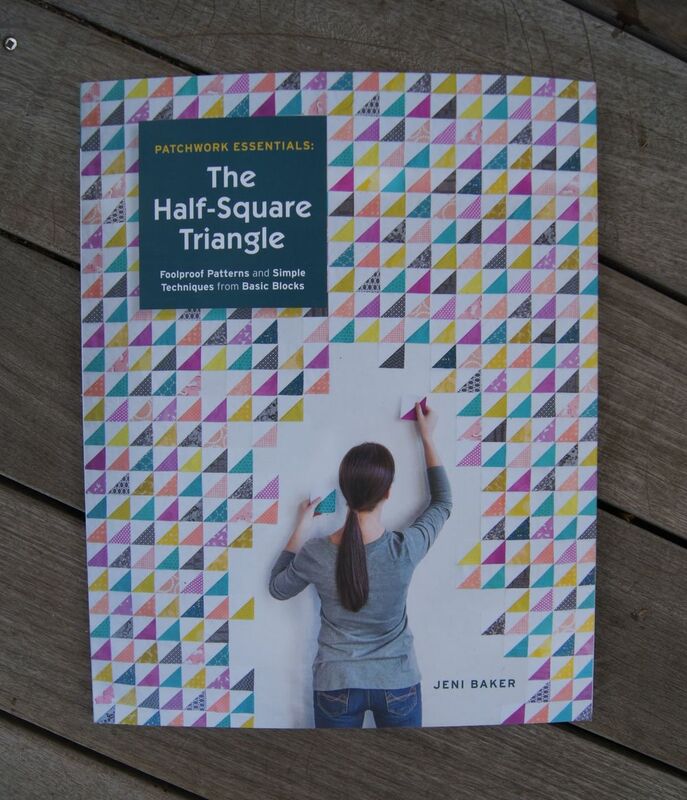 (I reviewed Jenis's new book, Quilting Essentials: The Half-Square Triangle in my last post). She has a free tutorial on her blog, Incolororder.com for a 10 x 7 inch "Everything Bag." She also has a PDF pattern for purchase which is what I have. The purchased pattern has instructions for 8 different bags from "Tiny Bag" to "Laundry Bag" as well as a worksheet for making any size custom bag. I love my 13 x 8 x 4 in project bag. It's the perfect size for my tablet, a notepad and some other gear. Got stuff to tote? Make yourself a happy drawstring bag to put it in! Lucky Spool Media, LLC have published another winner! This publisher is putting out some of the best new quilting books. 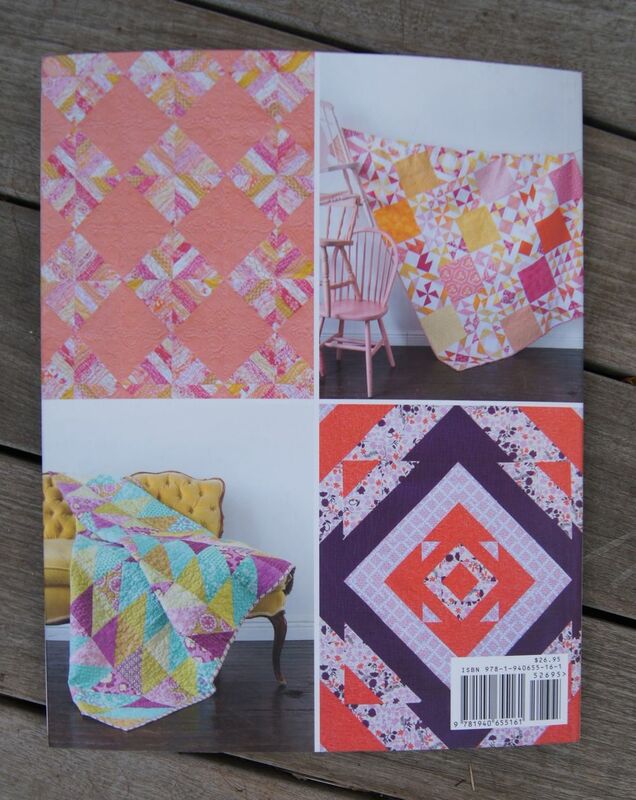 Patchwork Essentials: The Half-Square Triangle by Jeni Baker was released in October. I just picked up a copy. This is a great book for novice quilters and a good resource for experienced quilters. Jeni demonstrates 3 different methods for making Half Square Triangles (HSTs). Her favorite method makes 8 HSTs at a time. The quilts in the book vary from somewhat traditional to very modern. She has included chapters on color theory and color emphasis which is important for designing a quilt with just HSTs. The chapter I particularly appreciate is a library of 60 blocks comprised of just HSTs. All of the blocks have been pieced, they aren't just diagrams! I have friends who like nothing more than standing at a design wall moving pieces around to see what happens! And I admit to having fun exploring options in Electric Quilt 7 on the computer. But sometimes it's great to be able to quickly see the possibilities for a block layout. This HST block library does just that! The book also includes black and white grids for all the quilts in the book. Jeni calls these a Quilt Coloring Book. The grids can be printed off and you can color the blocks to see how the colors you are thinking of using for a quilt will look. Fun! As with all books from Lucky Spool, this is beautifully printed. It's a lovely addition to any quilter's library! CALENDAR NOTE: The Proper Bostonian Quilters Guild has a Quilt Show starting this Friday, November 6 and continuing Saturday and Sunday. It's in the Monsignor Donahue Hall, St Theresa School, 40 Saint Theresa Ave, West Roxbury MA 02132. There will be lots of great quilts, vendors, a Boutique table and a Cafe and a fabulous Raffle Quilt (click the link above to see it!). 2 of my quilts are in the show. Hope to see you there!